Looking for a good quality memory foam mattress? 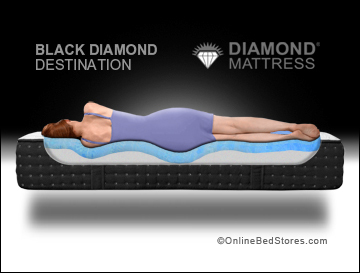 OBS has found the perfect mattress, the Destination 11″ Cool Touch GEL™ Memory Foam Mattress by Diamond mattress. This new Gel Memory Foam Mattress is constructed using CertiPUR-US® Certified high density foams that are free of PBDEs, TDCPP, TCEP (”Tris”) flame retardants, formaldehyde, mercury, lead, and other heavy metals. This new “bed in a box” is incomparable to some of the most popular “bed in the box” brands that are flooding the market. Many of these new direct to consumer investor funded startups are all promising the same thing, “a good mattress at a low price”. Many of these new mattress startups don’t have the years of experience in the mattress business, just lots of investor money for advertising and promoting their brand with one goal in mind, lots of customers to keep investors happy. These new start up brands have not stood the test of time. In contrast Diamond is different. They are a fourth generation family-owned and operated company that has been handcrafting mattresses in the USA since 1946. They care about their customers and products, which is why they focus on quality and are passionate about making high quality mattresses that will stand the test of time. Diamond Mattress offers an industry leading 20 year warranty and focuses on treating everyone like part of Diamond’s extended family. 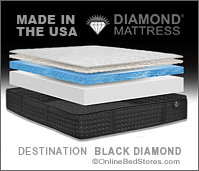 Diamond Mattress will never compromise quality to make a quick buck. The philosophy Diamond has lived by for 4 generations has made Diamond, California’s largest independent mattress manufacturer. Their new Destination 11″ Gel Memory Foam Mattress is available in three firmness levels, firm, medium and plush.